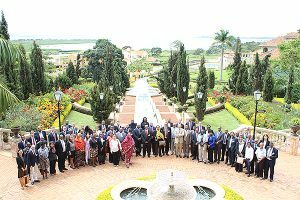 07-03-2017, Kampala (Uganda): The Intergovernmental Authority on Development (IGAD) this morning launched a two-day Technical Experts’ Meeting in Entebbe to discuss durable solutions for Somali refugees in preparation of the Special Summit of IGAD Heads of State to be held in Nairobi on March 25th, 2017. 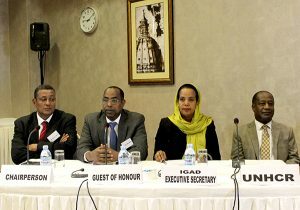 The experts’ meeting was opened during a brief inauguration session where senior officials from IGAD, UNHCR, the European Union, Ethiopia as the Chair of IGAD, and the Office of the Prime Minister of Uganda delivered keynote speeches. This meeting towards the Extra-Ordinary IGAD Summit on Durable Solutions for Somali Refugees is gathering experts in refugee affairs from the IGAD Member States and Yemen. The experts include refugee management agencies, ministries responsible for local government, ministries of planning and other relevant line ministries, as identified by IGAD. Development and humanitarian partners, academia, civil society and research institutions are also attending and contributing to the meeting. The purpose of the meeting is to discuss a draft Summit Working Paper, and to start preparing the core elements of the Summit Declaration and associated Action Plan. The Programme Manager of IGAD Health and Social Department (HESAD), Ms. Fathia Alwan representing the IGAD Executive Secretary, touched on the challenges in Somalia which are delaying durable solutions for Somali refugees: more than two decades of pronounced vulnerability of civilian populations in face of armed and internal conflicts, very limited – if not lack of – social services, the lack of reliable population data and demographic statistics, and the limited reach of the state and public institutions. For this reason, Ms. Fathia proposed, in her remarks, that focus should be given to providing assistance and support to Somalia in these four areas in order to achieve sustainable solutions for the Somali refugees issue. Director of the UNHCR Africa Bureau, Mr. Valentin Tapsoba, applauded “the decision by IGAD Member States to organize a Special Summit looking at a comprehensive regional approach to deliver solutions for Somali refugees.” He reassured of UNHCR commitment “to join forces with renewed energy to achieve the objectives of the Summit”. On his part, he UNHCR Special Envoy for the Somalia Refugee Situation, Amb Mohamed Affey noted the unprecedented character of the upcoming IGAD Summit. He highlighted the commitment by IGAD leaders to finding a sustainable solution to the Somalia refugees’ crisis living in the IGAD region. The Deputy Trust Fund Manager at the European Union Emergency Trust Fund for the Horn of Arica, Mr. Fulgencio Garrido Ruiz, informed the audience that the issue of displacement and migration was on top of the agenda of his organization. He noted that networks of smugglers should be addressed while the benefits of legal migration should be highlighted. The Deputy Director of the Administration for Refugee and Returnee Affairs from Ethiopia, Mr. Zeynu Jamal, reminded the participants the assistance provided by his country and other IGAD member States to the refugees from Somalia, and called on for more social services to be provided to them. He appreciated the regional approach to finding sustainable solutions to the Somali refugee issue, hence the Meeting of Experts and the upcoming Summit on the subject matter.